Categorized as: Stories on May 31, 2014. 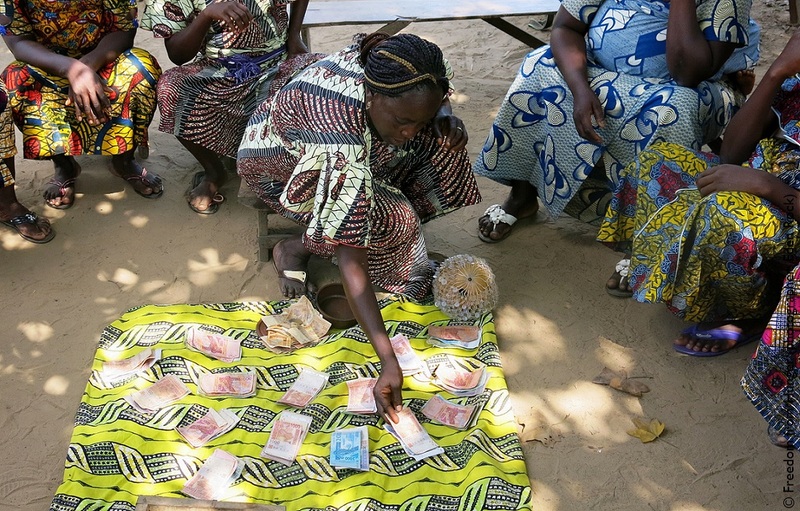 Guest post by Eden Rock from Freedom from Hunger explains how her organization supports grassroots growth of savings groups, where Africa’s poorest women show remarkable discipline by setting aside savings from their subsistence earnings of $1-2 per day. Editor’s Note: Freedom from Hunger co-developed Saving for Change with Oxfam America and the Strømme Foundation of Norway to enable groups of women to deposit savings and build lump sums for predictable needs. When savings accumulate, the women in the group act as their own bankers, approving small loans to each other from their pooled savings. The interest they charge each other for the loans goes back into the pool of savings, yielding a return on the deposited savings for each member of the group. We’ve supported this and other programs for Freedom from Hunger since 1992. Share our firsthand look at their savings circles here. brings innovative and sustainable self-help solutions to the fight against chronic hunger and poverty. It equips women to succeed at the very thing they are already determined to do—feed their children, improve their families’ health and create positive change in their villages. Freedom from Hunger works in developing nations where chronic hunger is suffered by a large portion of a country’s population. The focus is on rural regions where poverty and hunger are at their worst. The record-keeping is simple, and the participants monitor all the transactions. Freedom from Hunger works with local NGO partners to train women to start their new groups and manage their own financial needs on an ongoing basis. Freedom from Hunger brings innovative and sustainable self-help solutions to the fight against chronic hunger and poverty, mostly in developing nations where chronic hunger is suffered by a large portion of a country’s population. Their focus is on rural regions where poverty and hunger are at their worst. They equip women to succeed at the very things they are already determined to do: feed their children, improve their families’ health, and create positive change in their villages. Fifteen women are wrapping up a meeting at which they have distributed the fruits of their labor over the course of a whole year. Every one of them has saved the equivalent of 20 cents a week, and by lending those savings on to each other with interest, each now holds nearly $30 in her hands. 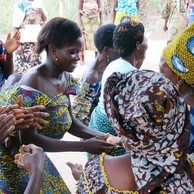 The atmosphere of celebration is infectious, as the brightly dressed women sing songs of pride and appreciation and dance with joyous abandon to the accompaniment of drums and steady clapping of onlookers. The saving circle’s treasurer counts the cash brought in by each member. As a program director at Freedom from Hunger, I am deep in the rural countryside of Bénin visiting the local nonprofit organization that we have trained to implement our savings group program. Called Saving for Change, this program epitomizes self-help by empowering women and young people to independently form and manage saving and lending groups and support changes that create and build financial opportunity, assets, and communal solidarity. The agent guides the group to elect a management committee and decide on the group name, social objective, and a set amount each member will save at each meeting. The group also together decides the amount and length of loans they will make to each other, the length of their saving cycle, and fines they will levy on each other for infractions (arriving late/late payments, etc.). Over time, the joint savings create a pool from which members can periodically borrow to meet unexpected needs and/or start or expand an income-generating activity or invest in assets such as livestock. Loans are repaid with interest, allowing the group fund to grow . . . and to grow quickly. Funds are only accessed during group meetings and in the presence of all members. They are kept in a locked cashbox between meetings. Using skills and strength of memorization, as well as a buddy-system of “helpers,” record-keeping is entirely oral and allows all members to witness and validate transactions transparently. Group meetings also allow a safe place for women to discuss important community issues and provide a convenient opportunity for the delivery of education sessions about financial, business, or health matters that are facilitated by the Saving for Change agent. At the end of an annual savings cycle, the group members divide the funds in proportion to their savings contribution, take stock of their achievements, and decide which changes to make as they begin a new cycle. Sharp-eyed members observe the accounting of this week’s savings deposits, and loan and savings interest payments, of the group. Today’s celebration captures the joy of shared savings and of the power of earning and learning together. What I see in Bénin fills me with awe, wonder, and respect for the women and young people for the way they face adversity and embrace a way to a better future; I am personally humbled and appreciative of the opportunity to be a part of it. What I see when I look inward at my own savings habits fills me with shame. At best, I consider myself a lazy saver; at worst, an unconscious one. Unlike the savings group members, I have access to a wide range of financial services and choices at my fingertips, yet I make the excuse of being “too busy” to take full advantage of them. If the women for whom I work can manage to “invest” one hour a week to hold each other accountable to deposit savings and manage their loans and repayments—in the midst of their seemingly endless tasks of caring for children and elderly family members; cooking; cleaning; laundering; growing subsistence gardens; working the fields for cash crops; doing multiple types of small businesses such as petty trading, handicrafts, or food production—I can certainly invest the few minutes it takes to schedule an automatic transfer from my paycheck to a savings account. If the women and young people for whom I work—unable to read or write, with perhaps a few years of schooling to their name—can manage to be bold enough and trust each other enough to develop their own banking system where none exists—I can certainly overcome my reluctance to learn something new and do what it takes to become fluent in online and mobile banking. Author Eden Rock (center) learns some humbling lessons from West African women who’ve overcome obstacles most American women shudder to imagine. In my personal life, I have not made saving for a future goal a first, or even a second or third thought. I returned from my last working trip inspired. I am taking the steps I need to become a disciplined saver: opened a dedicated savings account, set a budget and a savings goal. I now feel the accomplishment of making progress towards a goal. I notice that as my account rises, my stress decreases, knowing that I am taking action to weather the inevitable unknown. Indeed, we are all one: it is never too late, and it is never too little, to safeguard the future. Watch a saving circle in action: Click here or watch the embedded video below. Read more about what we can learn from rural African savings groups in Suzanne’s story from Mali, here. Photographs courtesy of Freedom from Hunger. READ more about the Saving for Change program here. DONATE to Freedom From Hunger so it can continue to provide life-saving solutions to women and their families worldwide by clicking here.